I have recently encountered an issue where one of the databases suddenly moved to Recovery Pending status. Database [dbname] cannot be opened due to inaccessible files or insufficient memory or disk space. I checked the database and it is in Recovery Pending status. Recovery Pending means that recovery cannot be started. Until the cause is fixed, recovery cannot run and the database cannot come online. I then checked the drives in the server and one of the drives is down and not accessible. We brought the drive back online but still the status of the database is not changed. I had to restart the SQL Server service manually and the database is automatically recovered. SQL Server Database can be very slow if the database is not maintained and monitored properly. One of the maintenance plan is to optimize the indexes in the system periodically. 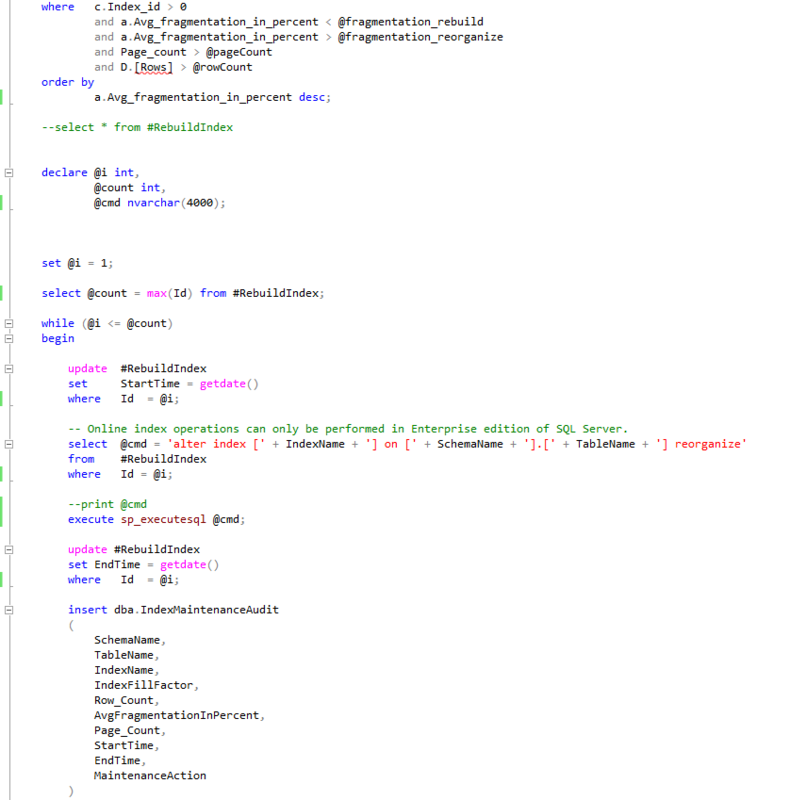 I have recently created a stored procedure to optimize the indexes in the database and scheduled it to run every week. There are two ways the indexes can be optimized. It is not a good idea to rebuild all the indexes in the database. After reading a lot of materials online and from my experience I would recommend rebuild indexes where fragmentation is > 30% and reorganize indexes if the fragmentation is between 10% and 30%. 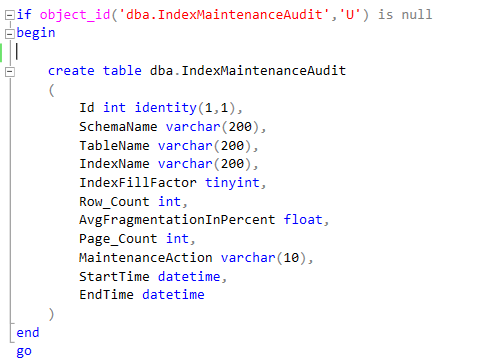 There are DMVs to find missing indexes, unused indexes etc…. However I am focusing only on optimizing the indexes in this post. Rebuilding indexes can be done in online mode or offline mode. If it is done in offline mode, then the server will lock the table from any read/writes. If it is online, then it allows the users access the table but can take little longer to rebuild the indexes as it has to create a copy of the old index so the users can continue to access the indexes. Note: Online index operations can only be performed in Enterprise edition of SQL Server. 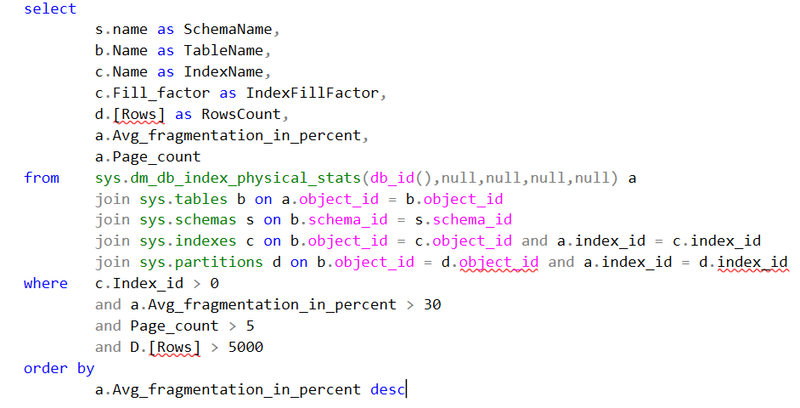 The above query returns all the indexes with fragmentation %, table name, schema name, row count and page count. So you can filter the indexes you want to optimize using the above query. I wouldn’t optimize indexes that has few pages or few records. Index_Id 0 is a heap so I have excluded it from my query. 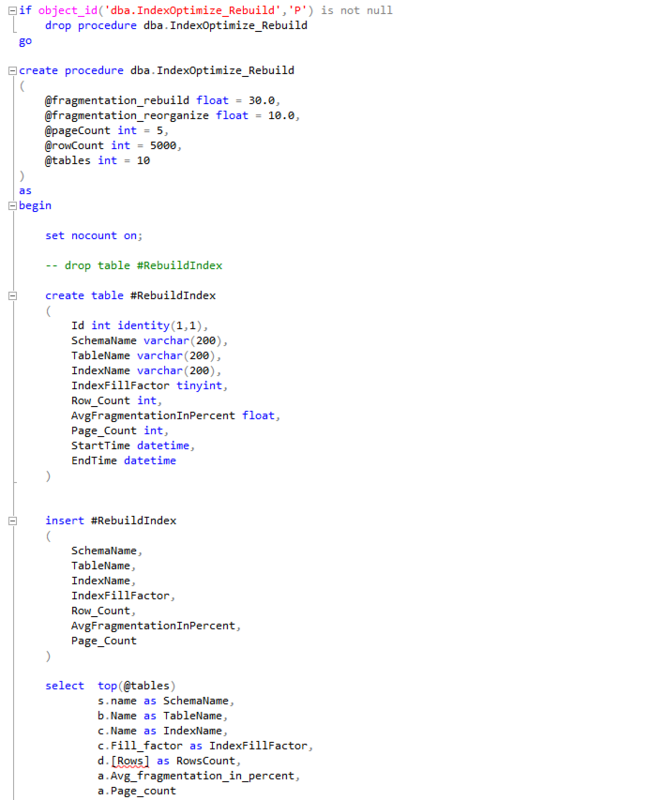 I have written two procedures for reorganize and rebuild just to avoid complexity and it can be merged into one as it shares most of the code. Once you created the procedures and table place the procedures in a job and schedule to run weekly or monthly based on your database needs. Monitor the audit table regularly and make amendments to the schedule of this job. 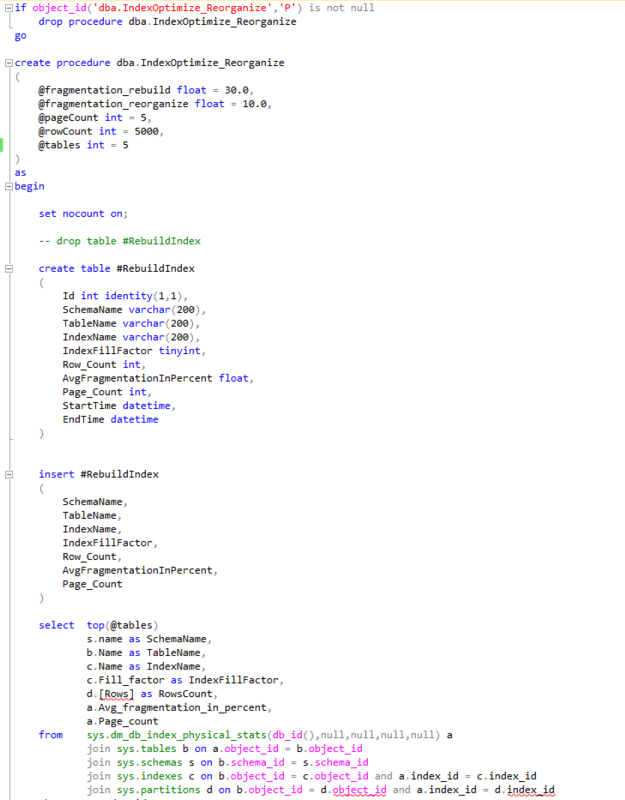 Here is the code for audit table and two procedures one for index rebuild and the other for reorganize. -- Online index operations can only be performed in Enterprise edition of SQL Server. I recently setup a job to backup transaction logs for live databases every 15 mins. To prevent these files filling up the drive, I needed to to write a script to delete old log files so that it can be automated. 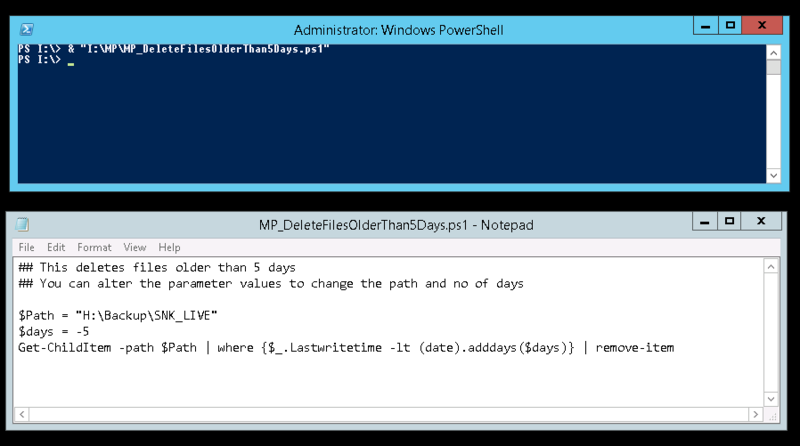 Here is the Powershell script I have written to delete files older than 5 days. The no of days and the path are parameters, so the values can be changed as required. This then needed to be added as a scheduled task in windows scheduler. 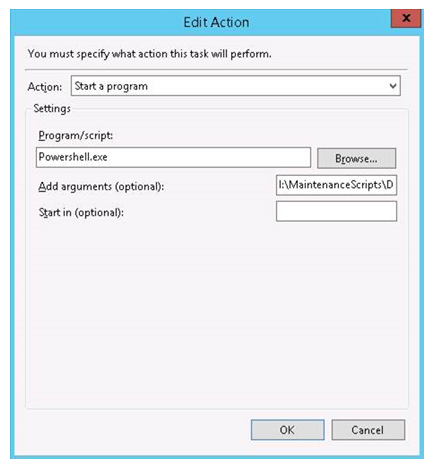 When a Powershell script needs to be scheduled, in the action window write Powershell.exe in program and specify the script file name with path in the argument text box as below. 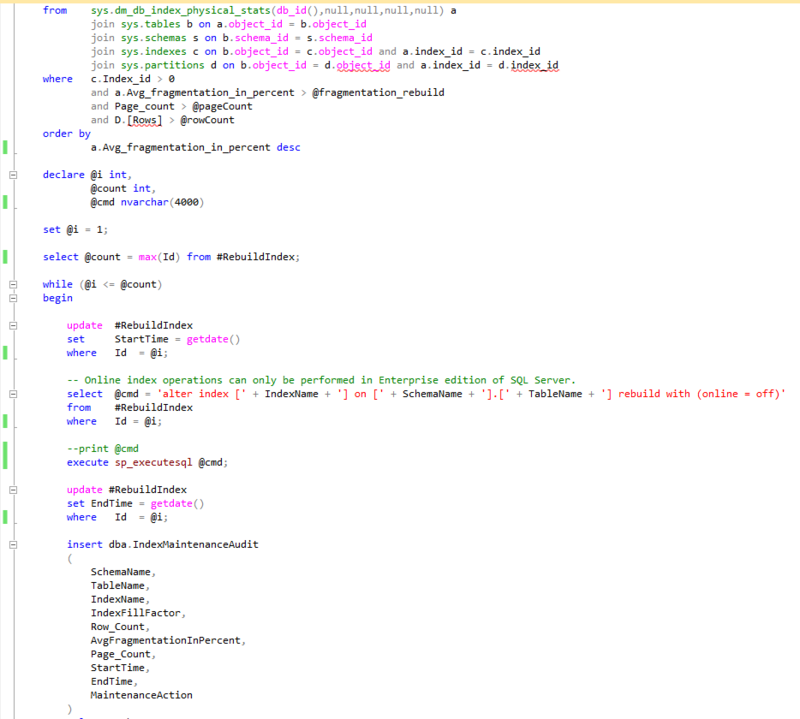 Here is the text from Powershell script for anyone to copy and paste. I recently came across a situation where one of the drives in production server is almost full. There are two large databases and they were backed up daily once. No other backup plans were in place. That drive is filled by the log files of these two databases (~200GB each). This has happened because the databases were in full recovery mode but transaction logs are not backed up. Note: Shrinking the log file is not a good option to do it regularly. I had to use the shrinking option because this is one-off and the log file has grown that big is due to lack of log backups. -- shrink the truncated log file to 100 mb. -- reset the database recovery model. I have recently encountered a situation where I had to move the log files of a database to a different drive. Here is the code to move the file to a different drive. The database will not be accessible while performing this task. Here is an example script to restore a database from multiple backup files and the destination database has several data files. 2014-10-31 14:36:18.45 *** Error: BACKUP LOG cannot be performed because there is no current database backup. This message is thrown because the database is never backed up fully before. Do a full backup of the primary database to solve this issue. 2014-10-31 13:34:00.33 *** Error: BACKUP detected corruption in the database log. Check the errorlog for more information. BACKUP LOG is terminating abnormally. Processed 8 pages for database ‘<Database Name>’, file ‘<Database Name>_Data’ on file 1. Processed 2013584 pages for database ‘<Database Name>’, file ‘<Database Name>_1_Data’ on file 1. Processed 1380536 pages for database ‘<Database Name>’, file ‘<Database Name>_2_Data’ on file 1. Processed 1671736 pages for database ‘<Database Name>’, file ‘<Database Name>_3_Data’ on file 1. One of the solutions is to configure the log shipping all over again so the logshipping job will initialize the secondary database. 2014-11-03 14:53:02.85 *** Error: Cannot open backup device ‘\\<Server>\LogShippingBackups\DatabaseName\DatabaseName_20141103145302.trn’. Operating system error 5(failed to retrieve text for this error. Reason: 15105). SQL Server agent does not have appropriate permission to access the shared folder. Granting access solves this problem. Copy the data and log files to the new location.